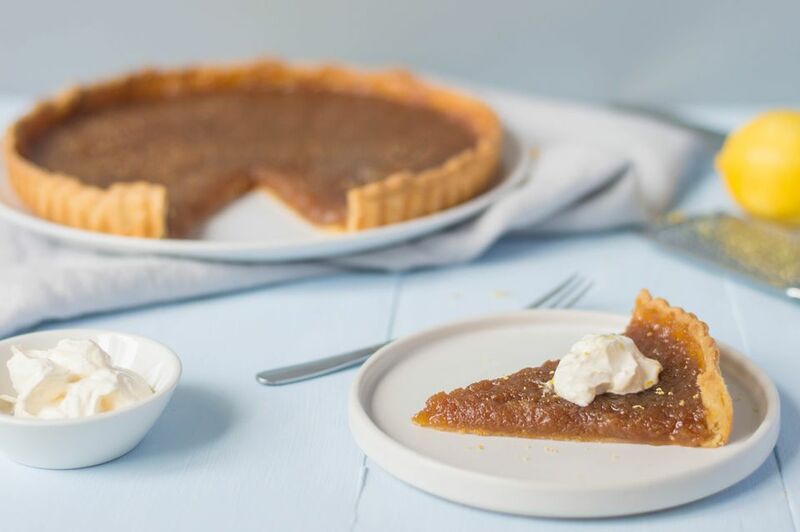 If you have a sweet tooth, then treacle tart is the one for you. The tart can be served as a pudding with custard or a dollop of cream. Alternatively, serve a slice with afternoon tea, or simply as a treat with a cup of tea. This may be a rich dessert but don't worry because you only need a small slice to enjoy the delicious taste.You will not be sorry. The recipe involves first making some pastry, but if you are short on time, ready-made will do. Roll out the shortcrust pastry to 1/4-inch. Line a lightly greased 9-inch ​loose-bottomed tart tin with the pastry, trim off the edges, then place in the fridge for 30 minutes to rest the pastry and prevent shrinkage in the oven - do not be tempted to miss this stage out or your baked cake will shrink unevenly. Place a baking sheet in the preheated oven. Meanwhile, mix together the golden syrup and treacle with the lemon zest and juice. Beat the eggs in a bowl and add to the treacle mixture. Finally, stir in the breadcrumbs. After the pastry has rested for 30 minutes, place the case on the preheated baking sheet, then carefully pour the mixture into the prepared tart case. (Tip: taking the mixture to the tart in the oven rather than the other way round, is easier and helps prevent spillages). Bake for 20 to 25 minutes, until the crust and filling are golden brown and firm to the touch. If serving as a pudding, leave it on the rack to cool slightly for 5 minutes. Serve with either crème fraiche or vanilla ice cream, which balance the sweetness of the tart very well. For later, allow the tart to cool completely before storing in an airtight tin. The tart will keep for a day or two. It reheats up nicely in a medium hot oven. The tart is full of delicious, sweet golden syrup. If you can't find golden syrup then use corn syrup. As a substitute for black treacle, you can use black molasses. Just be careful not to over-measure, as the taste is much stronger than treacle.